Stock Android 4.4 KitKat ROM for Nexus 4! - Rooted ~ AndroidRootz.com | Source for Android Rooting, ROMS, Tricks and More! Stock Android 4.4 KitKat ROM for the Nexus 4 makes it easy to just simply flash this ROM using a custom recovery to get to the latest version of Android. If you weren't aware if your rooted you cannot get OTA updates, meaning that your stuck on the current version of Android unless you unroot and wait for the OTA update or wait for a custom ROM that you like to be updated. Either way flashing this stock Android 4.4 ROM makes it easy for you to upgrade the Nexus 4 to Android 4.4 KitKat without any problems. Also this ROM already comes rooted! 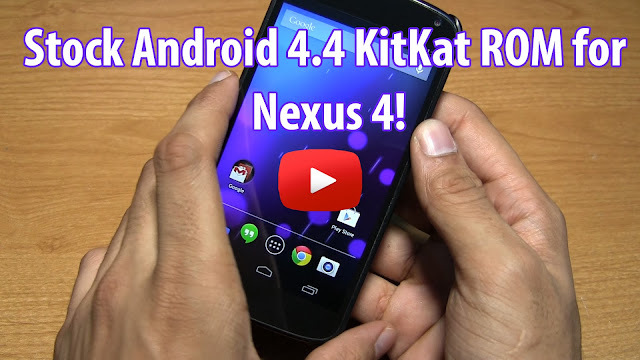 Download Stock Android 4.4 KitKat ROM for Nexus 4 using the link below!